PSD2 forces banks across EU to add two-factor Strong Customer Authentication (SCA) on all remote access to customer accounts. Hidden behind this is a deeper requirement—the need to perform a Strong Customer Identity Verification (SCeID) process on both the initial issuance of the authentication credentials and any subsequent remote re-issuance when credentials are lost. 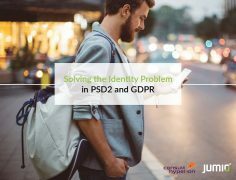 The aim of this Jumio white paper is to examine the links between SCeID and SCA bearing in mind the inter-relationship between PSD2 and GDPR. Provide the details below and this free white paper is all yours! By downloading this white paper you agree to share your details with Jumio. If you do not wish to receive marketing communications from Jumio, please email marketing@bankingtech.com. A compilation of books from the world of business, finance and technology.